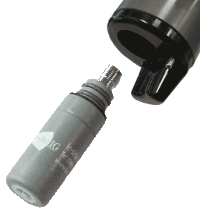 The Model 50 Holder with Model 51 replaceable pH Electrode cartridge comprise the pH sensor, which incorporates embedded electronics, custom geometry, and a field proven cartridge. The embedded electronics in the Model 50 Holder includes a built-in electrically isolated preamp, which results in reliable digital communications up to 2000ft from the analyzer, and temperature compensation circuitry. Our holder's custom geometry incorporates a quick disconnect design that makes for easy cartridge changes, short downtimes, and facilitates the integrated jet clean. Our flat glass / double reference junction construction, yields a field proven cartridge producing long-lasting reliable measurements. The M-51 is a cartridge type electrode making replacement simple and easy. 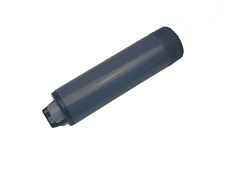 The cartridge is sealed into the holder with a reliable double o-ring seal. All replacement electrodes ship complete with o-rings. 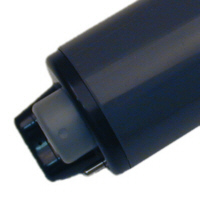 The threaded TNC connector at the top of the electrode body ensures a reliable electrical connection to the holder. In the center of the measuring surface is the pH sensitive flat glass. This surface is surrounded by the flat porous reference junction. The large area of this porous junction has thousands of pores allowing for excellent sample contact. The electrode is enclosed by the electrode body. Built into the electrode body is a sealed, gel filled double junction reference half cell. This design adds an extra barrier against contaminants. This also allows the electrode to be used in applications where sulfides, heavy metal ions, and similar materials are present.